Members of the College of Fellows are hereby invited to submit a nomination for the position of Dean of the College of Fellows. The Dean shall be elected by Fellows from the list of nominations. The election shall take place in the last year of the office of the current Dean and be adopted at the Annual General Meeting. The term of J. Robert Thibodeau, FIRAC, of Vancouver, current Dean ends June 1st, 2018. The mission of the College of Fellows is to strengthen and reinforce efforts of the Institute in its endeavour to enhance and develop the profession of architecture. Founded in 1941, the College of Fellows formally recognizes members and distinguished laypersons who have made outstanding contributions to the profession. Fellowship in the RAIC is an honour conferred on members singled out for their contribution to research, scholarship, public service or professional standing to the good of architecture in Canada, or elsewhere. The Dean shall serve a three-year term commencing at the College of Fellows Annual Meeting in June 2018. In the interest of fair play, current Officers of the College and other National Committee members and members of the Board of Directors of the RAIC shall not nominate or otherwise publicly support a candidate. 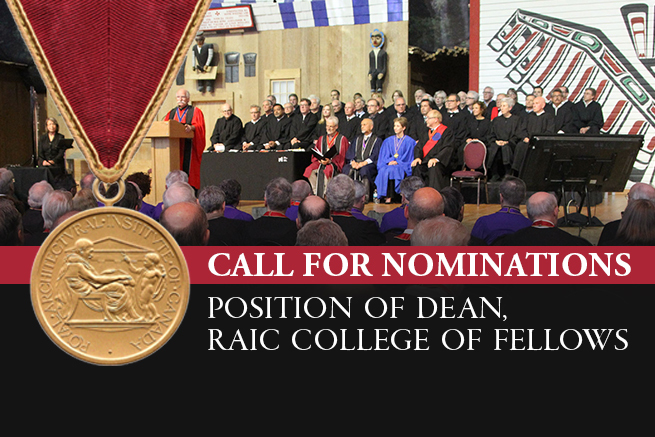 • The completed nomination form, accompanied by a 200-word statement from the candidate, outlining briefly the candidate’s background and vision about participating as an Officer of the College, should be e-mailed, delivered or faxed to the RAIC National Office (see below) to be received by February 26th, 2018. • An election ballot will be e-mailed to each Fellow and a hardcopy will be mailed to Fellows without an email address, including a list of the names of all candidates, a copy of each candidate’s statement and the names of the Fellows nominating each candidate. The nomination form can be nominated here.